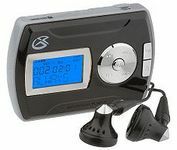 Rock on--and on and on--with this 1GB MP3 Digital Audio Player from GPX. With the ability to store up to 32 hours of music, you can take your tunes everywhere. But don't think this digital DJ limits you--it's easy to add to your personal playlist with the built-in SD/MMC memory expansion slot. Just create playlists on your computer, download to an SD/MMC card (not included) and plug into the player--it's just that simple. The specifications on the package say it works with SD cards up to 2GB but I've used 4, 8, 16, 32GB cards with it. Then I checked the card format, exFAT. The others were all FAT16 or FAT32! A bit og a Google found Ridgecrop Consultants Ltd. free FAT32 formatter utility. I downloaded and used that to reformat it then copied some tracks over. IT WORKS! Somehow this player made before the SDHC and SDXC standards existed is compatible with those cards (both as a generic reader and playing audio from them), as long as they're FAT32 format. I wouldn't be at all surprised if it can go even bigger. Mine does have a label on the back SUFFIX NO. :B1 I don't know if that has anything to do with its way beyond original specification ability.